🙂 The Galapagos is soooo awesome! What a super photo, one unlikely to be duplicated by anyone else! Besides the seal and bird convergence, you have people converging on the market as well. Ahhh – very good point about the people converging too 🙂 Hope you are enjoying your weekend. I recognised this scene straight away! I think I have the exact same photo with a few sea lions in the mix too! What an incredible place! Isn’t the Galapagos just something so special to experience? 🙂 Loved just sitting here people and wildlife watching! the sea lion made me laugh – he has no shame whatsoever! That is one cheeky sea lion! Most certainly cheeky 🙂 Not sure how he even ended up at the front! Good spotting 🙂 Hope you are enjoying the enjoying! Hehehe – yes Mabel! That sea lion is right up front under the bench…. Summer is well on its way which means its also time for us to put up our Xmas tree…. PS Enjoy your quiet weekend – we like those ones just to chill out at home! That reminded me of a visit to Lake Tawakoni Dam near Dallas, Texas. 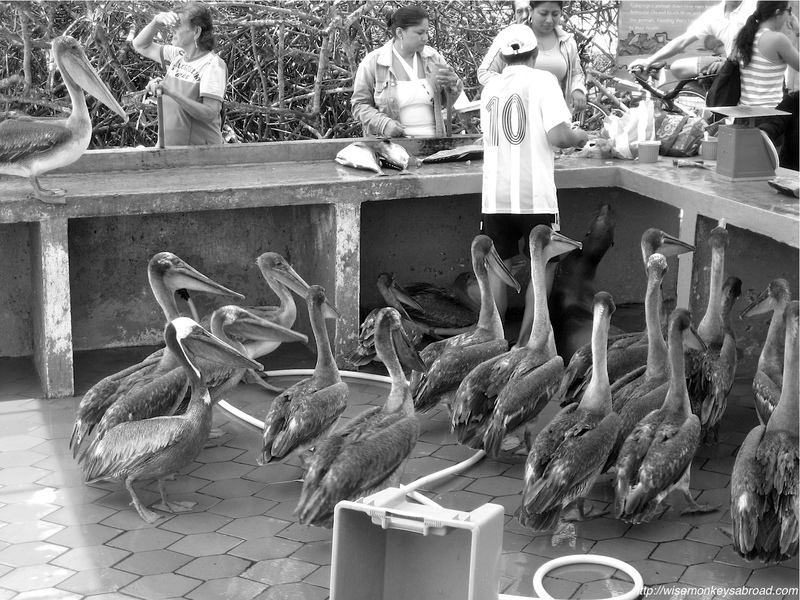 Where the water (and fish) flowed over the dam, there was a line-up of pelicans waiting for a free meal. If I have a picture it is buried away right now. If and when I find it, I will definitely post it. Maybe it would be a good excuse for another Texas trip. When I was there, my camera was not my constant companion like it is today. You’re welcome. It does look like a fun shot to have taken. Good shooting to you. What a fun pic, typical pelican, but I’ve never seen a seal in the mix before! Hehehe – it was a sneaky fellow to be right up front too 🙂 Thanks for your comment!! Glad you liked it. Great photo and interpretation of this week’s challenge! Pelicans always seem to know when a free feed is on the cards.